Like nearby Llewellyn Gulch, Davis Gulch is a canyon of two halves; a narrow upper slot, here particularly tortuous in parts and challenging to explore, gives way quite abruptly to a much deeper and wider downstream section. 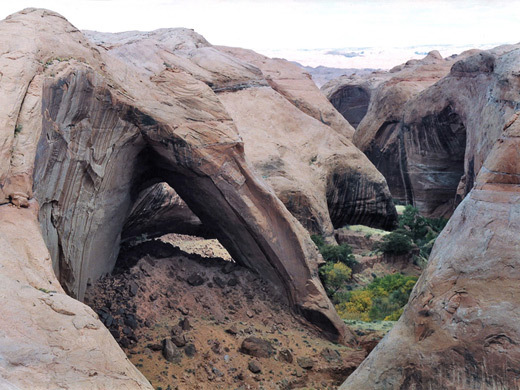 This is a sheer sided, Navajo sandstone drainage typical of the Escalante region, extending for 3 miles until the gulch meets Lake Powell, and has one unusual feature in the 100 foot high Bement Arch, a huge bridge of sandstone. The upper part is perhaps more interesting with almost a mile of twisting, slanted passageways blocked by frequent chokestones, dryfalls up to 4 meters and pools/mud in wet weather. Other canyons in the area are more photogenic though. 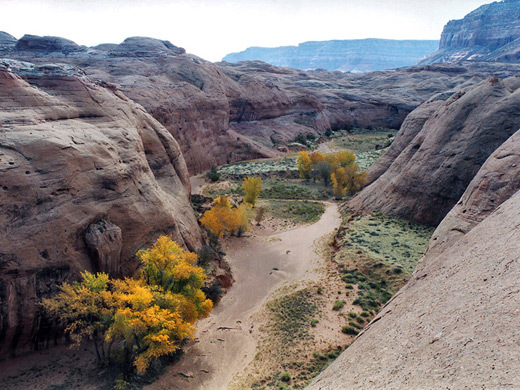 The gulch is easy to find but maybe not so easy to reach as it requires a drive of 50 miles along the unpaved Hole-in-the-Rock road, the latter portion of which has several steep dry wash crossings that may be quite rough at some times of the year. The drainage is recognisable as the first encountered after the road descends from the plateau at the edge of Fiftymile Point - there is a parking/camping area at the far side, just beyond where the road passes over several meters of slickrock at the head of the canyon. Despite the remoteness, Davis Gulch seems to be quite popular, judging from the number of footprints and shoe leather marks on the walls. 11 views of Davis Gulch. TopoQuest topographic map of Davis Gulch. 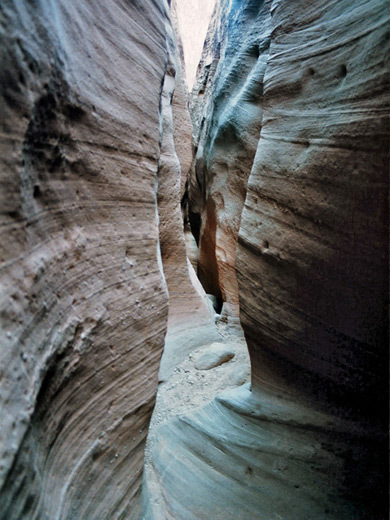 The slot canyon must be the closest to an access road of any in the Escalante region, beginning after just a couple of minutes walk down the dry wash. 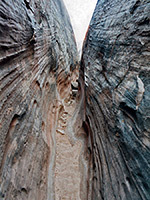 It deepens in several steps, as level, sandy passages are separated by moderate drops of up to 8 feet over chokestones, all of which are relatively easily downclimbed. Quite soon - after a few hundred meters - the smooth sandstone walls fall away and the gulch opens out into a wide clear area then restarts in similar fashion a short distance further. 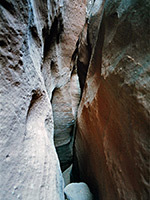 As before, boulders are wedged in the canyon at intervals but now the passageways are narrower, sometimes angled away from vertical, and there are several tight squeezes between the easier sections so overall the going is quite strenuous. The walls are generally not quite vertical but always steep - V-shaped cliffs that curve away high above and form huge domes. In places the floor is bare rock that narrows to a point while in others it is covered by sand or mud, and tidemarks indicate lengthy standing water up to 2 feet deep may be present in wet weather, sometimes with drops into the pools of 4 feet or so. Several tricky obstacles are encountered as the end of the canyon approaches and the slot section constricts even more and deepens significantly, ending soon after a near vertical slide of 15-20 feet, of which the last 7 feet may be into a pool though all will be completely dry at some times of year. At times this may require swimming, therefore, and this is the only part that cannot be re-climbed without ropes; even descending does not look easy. 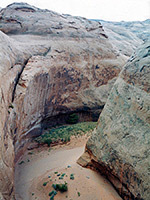 Soon after the big drop, the canyon becomes box shaped, enclosed by steep, desert varnish-covered walls and a flat floor across which the streambed meanders, past sandbanks, bushes and cottonwood trees. Large domes and steep side-ravines mean it takes quite a while to follow the gulch at rim level but the scenery is interesting - one worthwhile diversion is a short, very twisting tributary slot that can be explored for a while, mostly by bridging above many deep, interlocking potholes. Half a mile further along the main gulch the great curve of Bement Arch (aka Nemo Arch, named by Everett Ruess, an early explorer of the Escalante region who disappeared whilst exploring this very canyon) comes into view, by which stage the gorge has a flowing stream and is both very overgrown with reeds and willow trees, and filled with high, bushy sandbanks and fallen boulders. From the arch another two miles of the gulch and its surrounding domes extend east to Lake Powell, though the undergrowth means it takes quite a long time to progress downstream. There is just one recognized re-entry point, a steep cairned stock trail quite near the lake, and so this is the usual way out if descending the narrows. A quicker way back to the trailhead is to head more north before turning west as there the terrain is more level.